While we are all going about our daily business this month, big business is going about trying to make sure that Europe is run purely in its interest. If agreed to by the European parliament, the new Free Trade Agreement between the United States and the European Union, better known as TTIP, will do immeasurable damage to the lives of citizens across this continent. The progressive organisation Global Justice believes that it poses "great risks to hard won measures to protect public health, worker rights and the environment." Essentially, TTIP is "designed to take away barriers which are behind the customs border – such as differences in regulations, standards and certifications" of goods for trade. This may sound reasonable but what it means is that Europe would be required by law to have exactly the same product rules as the United States, which are widely known to be the loosest and most anti-consumer protection in the developed world. 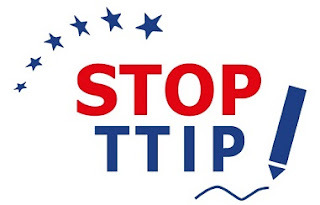 The TTIP negotiations have all been conducted in secret sessions - closed to the public and the media. The leaks of information from the meetings have shown that TTIP would mean that any business could take any government to court if they believed that a government policy threatens their profits. This legal method, (known as the Investor State Dispute Settlement (ISDS) mechanism) has already led to countries being sued for putting health warnings on cigarette packets, regulating medicine and energy prices, raising minimum wages, and removing tax incentives. TTIP would further strengthen the power of big business (because only the largest can afford it) to control what national parliaments can and cannot do for their private citizens. Fracking, to take just one other example, would be more likely to go ahead because public administrators would want to avoid costly litigation that they are likely to lose defending a decision against it. On top of all this, there is a fear – from the European Commission itself – that because of TTIP changes up to one million workers employed in small businesses are almost certain to lose their jobs. So, if accepted, TTIP may well worsen inequality across the EU. They argue that this practise is also creating drug-resistant superbugs but, in a positive development, several European countries have already drastically cut the use of antibiotics, and now EU ministers are negotiating laws to do so across the wider region. I would urge readers to think about taking action by signing the online petitions (as I have done) at the websites of the two organizations I’ve mentioned above in this article: Global Justice and Avaaz.